Review Spew has an extra copy of the book just reviewed by Major Undeclared. 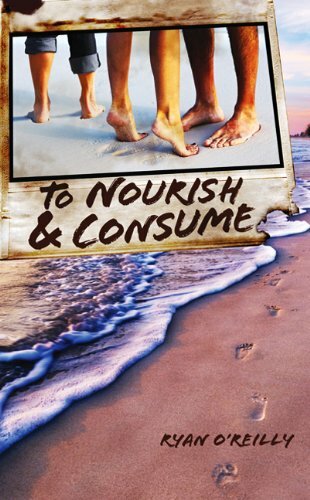 This copy of To Nourish and Consume by Ryan O'Reilly is brand new. It has never been flagged because of use in the bathroom, although if you'd like a bathroom-hardy copy, we can surely accommodate. To qualify for this book giveaway, you must reply to this post below or send an e-mail to reviewspew AT gmail DOT com. Sometime this weekend, we will take all the entries, write them on a piece of paper, and let my 3 year old son eat them. Whichever paper he does not eat, will be the recipient of this book. You will know if you are the winner because we will e-mail you. If you don't supply an e-mail, we will post the winner, waiting for your reply. You will receive the book no later than 2 years after you supply your address. Most likely it will be sooner, but we like to be safe in our estimates. Is this hard-cover? I'll take it. If this book is anything like Catcher in the Rye, or Lord of the Rings, or the Bible, or even just has words in some of the pages.... I want it! ....wait...2 stars! That's twice as many as one! Give me now! Using a complicated system of levers, pulleys, and software randomizing, the winner has been determined to be Mike!! Please send your contact information to reviewspew AT gmail DOT com.